Anderson Lithograph is one of the premier commercial printing companies in the United States, producing such products as annual reports and new car brochures that dealerships provide to consumers to facilitate a new car purchase. 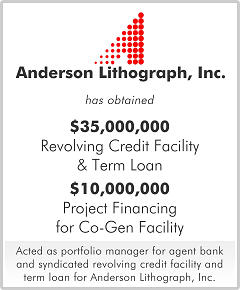 Anderson required a senior credit facility to both refinance existing debt and purchase new generation equipment, including digital pre-press equipment and additional Komori 8-color presses. In addition, Anderson had an opportunity to build a co-gen facility to convert natural gas to electricity which, among other things, provided climate controls on the press floor and profits through the sale of excess electricity to the market. The senior credit facility provided Anderson the ability to pursue all of its growth objectives and generated sufficient availability under its revolver to cover slower seasonal periods.